A rugged broom that is ideal for tough commercial and industrial applications. This commercial broom has a head that is thicker and wider than the regular household size, and it also has longer bristles. The part where the head screws onto the pole is also a bit thicker on this version, so it will remain more sturdy under higher stress. This is the perfect tool for sweeping while you work because it reduces cost, saves time, and eliminates frustration. If you compare performance of this tool against traditional versions, it will outperform all others for every application. It's easier to use, requires less work to achieve results, and will remove more dirt from your floors with each pass. Add to that the fact that this commercial broom is virtually indestructible, and you have a superior tool that will produce great results, and remain in like new condition for years. Perfect for construction sites, warehouses, barns, factories, plants, kennels, retail locations and more. Any place that sees large areas of floor cleaned on a regular basis can benefit from this product. It makes the job quicker and easier, and it will last much longer without wearing out or losing its shape. Stop wasting time and resources with those other brooms that only leave behind dirt, cause hair and fine particles to fly, and wear out quickly. 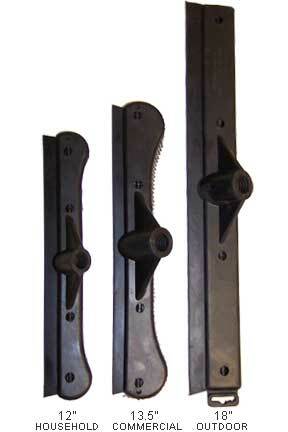 This one will retain its shape for the life of the tool thanks to the tough, natural rubber construction. The head is virtually indestructible under normal use, and has the ability to last for many years. It doesn't matter what surface you are cleaning, or the type of dirt you are sweeping. It will never scratch, scuff or mark any floor you use it on, and it's able to clean any variety or dirt. Because the head is made from rubber, you don't need to worry about it coming into contact with anything at your work site. Chemicals and cleaners won't harm it, and the pliable rubber is safe enough to touch any surface too. If it gets dirty, you can even rinse it clean or use soap and water for a more thorough wash. The rubber bristles will form a solid wall because they flex and bend as you sweep. This allows you to completely clean hard surfaces in a single pass, and makes it ideal for uneven surfaces, or flooring with cracks, because it conforms to any shape, and it dips down into cracks, grout and other crevices as you work. Fine pieces of dirt and hair will be swept away easily instead of being passed over or allowed to slip through. The sweeping action will also cause a static charge to build that only makes your job easier. Debris will get sucked in toward the head, and remain close as you clean. You will never have to worry about lighter stuff flying in the air, or floating away as you attempt to pile it. Since the head is one solid piece of molded rubber, you never have to worry about it falling apart or losing bristles. Due to the way it works, it's ideal for sweeping regular things, but even better for the debris that is normally frustrating to sweep. Use it with great results for pet fur, human hair, sand, saw dust, drywall dust, fine particles and more. The reverse side of the head features an integrated squeegee for added utility and convenience. A quick spin and you can flip the broom to reverse the head for drying floors, windows, vehicles and more. It is perfect for cleaning up after a flood, or removing unwanted liquid from any area, but it's also ideal for cleaning tasks that don't involve floors. Scrub siding on a house, or wash hard to reach windows without a ladder. You can also remove snow from vehicles without walking around them, or wash the tops of vans and trucks without a step stool. Since the bristles are safe for any surface, and able to gently deep clean with maximum efficiency, the combo of the head and squeegee make a powerful tool. It doesn't get in the way of normal sweeping, but when you need it, this squeegee can be very handy. This Broom can be used by pushing or pulling. For great results on any floor, the pulling method will always be best. As a push broom, it works very well for many types of flooring, but if you are going to use it on carpet, a pulling action is a must. For regular hard flooring, use it like any other. You are able to use long strokes, and a traditional motion. For areas of carpeting, you will want to use shorter, more deliberate strokes. This action will build a stronger static charge, and help the broom get deep into the nap of the carpet. If used correctly, it is able to pull up pet hair from a freshly vacuumed floor. Sweeping will build a static charge to make the job easier, and control the collected debris. To release this charge, you can tap the head against the ground a few times and it will go away. 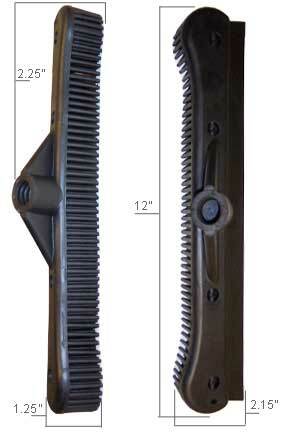 Hundreds of flexible rubber bristles work together to remove more dirt with less work. They bend and flex to get into corners, and under ledges, all the while forming a solid wall of cleaning muscle that powers through dirt to clean floors easily. Easy operation and incredible results are a good reason to start using this broom for your commercial or industrial application. The fact that it lasts a long time and also makes the job take less time is just icing on the cake. Once you start using this tool, it will be difficult to use any other. It can sweep, scrub and squeegee, and thanks to superior construction and commercial quality materials, it will last for years of regular use, even under harsh conditions. Pet groomers and kennel owners love it because it works so well for fur and hair. Contractors and construction workers love it because it can actually sweep up things like sand, sawdust and drywall dust. For cement floors in warehouses, garages and plants, there is no better tool. It can clean the yucky stuff out in a barn, or the less yucky stuff on the floor of a factory. Because it isn't made from nylon, or anything similar, it's not going to fray, lose it's shape, or wear out like you may be used to. It will deliver outstanding performance for many years, while keeping it's shape and performance level like new. This is the commercial size Sweepa Rubber Broom. It is the middle size we carry. If you are interested in one that is bigger or smaller, then click the following links: 12" Household Rubber Broom & 18" Outdoor Rubber Broom. If you already have a pole, or prefer a different style, then you can also just get the broom head by itself to save money. When compared to the household version, this one is wider and thicker, and it also has longer bristles. The outdoor size mainly has a difference in width. Both of the larger brooms will have a thicker, more sturdy thread where the pole attaches to the head, so for heavy use, one of those is best. All three are the same brand, and are made from the same materials. 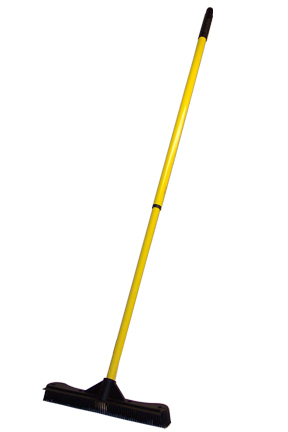 Handle Length 34" - 62"
Incredibly durable and long lasting, this is the perfect broom for commercial or industrial use. It will outperform traditional tools and last longer too. Save time, money and frustration when you start sweeping with this tool. Order One Today! Excellent product, excellent price, and fast delivery. I had the household broom and it lasted for approximately 15 years. I am very happy with the Rubber Brooms I bought! I had had another one from another company which had wore out. This is a high quality Broom which is great for picking up cat fur, but I mainly ordered these for a friend and myself for cleaning off our cars when it snows! If the snow has not hardened it is a breeze to brush it off. There are no metal parts such as nuts and bolts to scrape the car! Definitely high quality broom and a keeper! The rubber bristles do well in moving the leaves and debris off my deck, but I am having a little trouble getting used to pushing the broom rather than a sweeping motion. Sometimes the broom sticks when I push it, so I have to lift it a bit higher off the deck before pushing. Good quality. Fair price. I use mostly the squeegee to dry wet basement floors. Works well. Telescopic handle is a nice feature. I hate housework but I love this broom. It is sturdy and sweeps up dirt/sand I couldn’t see. I have dogs and cats that bring in sand (live in the desert) they shed and the wind blows a lot. I am pleasantly surprised with this product. It works well with trapping the fur. I would definitely recommend this to any pet parents. This sweeper is awesome. It gets up ALL the dirt and dust. I will have many asking about it and I will certainly let them know how to purchase one of their own. My grandkids had spilled orange soda on my oriental rug and I've tried a variety of ways to clean it without much results. This broom paired with a high traffic rug cleaner finally got the stain out. The brush has the right toughness and density to work the product into the rug and removed the stain after it had dried. I bought this to take the dog hair off my carpet that's left after you vacuum and it didn't work. My neighbor has one and she loves it and says it works for her but not for me. We use these in our dog kennel and boarding runs. Have used them for years and they are great. Works great on concrete basement floor and for dog hair on Berber carpeted stairs! Well worth the money. I have used this broom for removing snow from my cars and for loosening cat hairs from the carpet for the sweeper to pick up. Easy to clean. Wouldn't want to be without one. Didn't work as described .. at all .. not even a little. Returned. When I called to ask about returning the item for a refund, the rep tried to get me to try the smaller one instead. If this one didn't work, why would the other? I own a dog kennel and we've used these brooms for years. Absolutely love them. Works as described on website. It really drags out the lint and debris on our newly purchased oriental-style rug. Vacuum cleaner suction just is not strong enough to do that. Very pleased with the results. These commercial size rubber brooms are perfect for cleaning up dog hairs. Had the smaller size but replaced with these. They are more sturdy too. we have 2 dogs and a cat. Many days we thought about calling the exterminator to remove the giant dust bunnies. We have brought several dust mops, vacuums and brooms with the same results, the dust bunnies always won. Not anymore, this broom works. WOW! WOW! WOW!!!!! This broom is FANTASTIC!!! I vacuumed first then used the broom to see if it really got the dirt that was deep in the carpet. Yikes, did it ever. I can't believe I was walking on the carpet in bare feet. The carpet even looks brighter. The broom is light weight but super sturdy and well made. Get This broom. You will be so pleased with the results! Excellent well-made broom that is fantastic! Works great on floors and does an amazing job on sweeping dog and cat hair. I am extremely pleased with the rubber sweeper. a must for any salon! This broom has saved me a ton of times, AS WELL AS my back. I own a salon with painted concrete flooring. Using a regular broom was ridiculous. hair gets swept and instead of going into a pile, it just flies up into the air and lands wherever. This broom head saves SO MUCH time, with much less effort because of the static electric charge built up so loose hair am sticks to itself. ... Awesome broom. Try it. U won't be disappointdd. best broom ever. hands down. I had my first one for 8 years and after I broke it I tried to go with different rubber broom. I hated ever other one I tried. Glad to have the Sweepa back...I bought 2 to avoid being without one in the future. We love your product for our dog daycare facility. I also use it at my home. Very versatile and sturdy. Broom loosens snow and ice on roof and slide covers, squeegee removes with minimal water left so minimal ice sickles. Also soft rubber doesn't damage antennas, horns, etc.that are covered with snow. We love our Sweepa Rubber Brooms. It took a while to get them but they are super fantastic!!! Thanks so much for getting them to us. I ordered the 13.5" Rubber Broom which is a must have for pet hair or for any Hairdresser or Barber the best way to effectively sweep up hair. Never use a regular broom to clean hair from the floor which constantly sticks to the Brissel's. The Rubber Broom has been the best kept secret this is my second one Love it!! My new Sweepa broom is superb. My last one had finally worn out and I was badly in need of a quality replacement. I now have it. Thank you for your diligence in finding it and getting it to me. I LOVE this broom and have had a pr of them for more years than I can remember. Probably 20+ They don't wear out since they're rubber. Best thing on wood floors with shedding pets and outdoor debris off shoes. Gets the smallest stuff too. I,m buying a couple more for the patio & shed. By far the best broom I've ever used. It picks up all the hair and dust other brooms leave behind! We have several of these brooms in different widths and like them enough that we purchase them as gifts for others. The most recent purchase was such a gift. I foster dogs and also volunteer at an animal shelter and I am bowled over by how much more hair I get up with the rubber broom than an ordinary broom. I am truly happy with this product and recommend it highly for anyone with pets. I have told my friends. It's longer than my other sweepa like broom, and functionally it works very well.however it has a displeasing rubber smell, which has not decreased in magnitude since it's arrival. For this reason I would not recommend it to friends. It really gathers up the gritty stuff my dogs manage to bring in. It takes some getting used to but I feel it works much better than my nylon bristled angled broom. I've just recently received the rubber broom, I used to have one years ago. It does the job so much faster and better than a regular broom. I really dose eliminate the drudgery, and time consuming effort of sweeping and cleaning up... in, out and around the house. does the commercial sweepa come withthe pole? Yes. The product on this page is a complete broom. One rubber head and one pole. Will remove snow off automobile safely? It sure will. These are awesome for snow removal, and the natural rubber is safe for every surface of your car. I am looking at the 13.5" broom. I want it to remove snow from a car windshield. Is this the correct size that I need for this job? Also, it has a telescopic pole, right? What is the total length when at its shortest? I need it to fit in a med/large suitcase for travel. Thank you for your attention to this matter! The pole measures about 33-34" when fully collapsed. This tool makes an excellent snow removal tool for a multitude of applications. Does this work well for hardwood floors? Absolutely! I have hard wood floors, 3 shedding pets and a spouse who refuses to remove his shoes. This brooms gets it all, even all the really small stuff. It doesn't wear out either since it's rubber. I have had the handle pop off & have to be altered to hold it on but that's a small thing compared to the job this broom does. Of course. This broom is awesome on any type of wood flooring. Does this broom really work on plush carpet? I see most references made to hardwood flooring. Some will prefer the smaller broom when working on carpet, but yes, it really does work. I live in Arizona where we have frequent dust storms. Will this broom clean up layers of very fine dust from my patio floor? Yes it will. It's perfect for that job. Use the regular bristles, or flip to the squeegee side to collect every spec. how does the handle tighten? it only slides up and down. The handle is telescoping. You should be able to twist both sections in order to loosen or tighten the pole. If you are having trouble, please give us a call. Does it work at an angle, such as for under a bed or sofa? Yes. It will sweep just as well when angled to get under beds and other furniture. 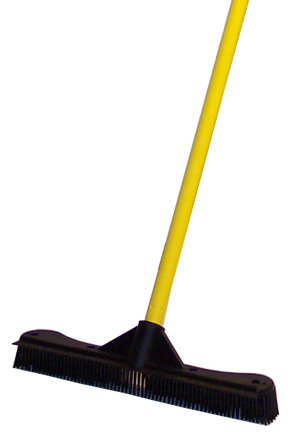 A 12" Sweepa Rubber Broom. Sweep, Scrub & Squeegee all in one! An 18" Industrial Size Broom For Bigger Jobs & Use Outside. A Powerful Tool. Get The Sweepa Rubber Head Without A Pole. A Telescoping Broom Pole With Commercial Grade Construction.